BONK! 47–Saturday, August 25th – BONK! 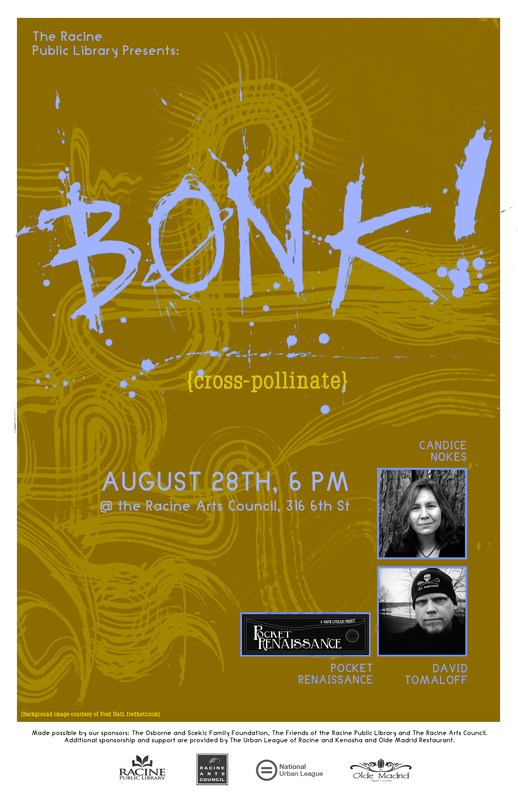 August 7, 2012 by BONK! writers, took “field trips” to important local art destinations, and created two collaborative book projects which are both available at their headquarters, the Black Eyed Press. Pocket Renaissance is all about inspiring and enlightening young artists and writers, and about putting art and community back in the same sentence. CANDICE NOKES, vocalist and songwriter, has been playing in the Milwaukee music scene for the last 21 years. Currently, she most often plays music with her husband, Mark Truesdell, forming their duo (sometimes trio), The Spirals. Candice has also played as part of the band “Mark Truesdell & The Lost Pioneers,” as well as with the Milwaukee Symphony Chorus. Candice invested her first summer as a guitar instructor and band coach at Girls Rock Camp in Madison in June 2011. Investing musical and self confidence building time with girls ages 8 – 18 brings both of Candice’s passions together at one time, as she is also a psychologist.